We are looking for an Account Executive to join our rapidly growing team at Media Maison. Our team is really looking for a smart, hard-working, and creative-minded person with a go-getter attitude who is eager to learn and take on new projects! To apply, please send your resume, writing samples and any placements you've secured. - Your Experience - Candidates must have 2-3 years PR experience (not including internships), preferably with an agency and/or consumer products company. Candidates must have client facing experience and the ability to be a main point of contact for 3-4 different accounts. - Who You Know - Established media connections with both national and local contacts (broadcast, print, digital, influencers, etc.). Candidates must have strong pitching experience and press placements. - A Strong Voice - Being able to communicate clearly and effectively with clients, team members, and media is key when joining our team. - Be Organizationally Strong - Plans and delegates in a productive manner, focusing on creating actionable plans to meet our client's goals/needs. - Be Creative and Think Outside the Box - We need you to love coming up with new and experimental ways to tell our clients stories in 100 different ways. - A strong company culture - We have a dog-friendly office, a fantastic collaborative work space, weekly activities held in our office / building, we never miss the opportunity to celebrate a birthday, and we have a penchant for recapping last nights best TV shows each morning! - We invest in you - We offer competitive health care benefits - as well as unexpected perks for individual milestones and achievements. - Atypical Time - PTO is in addition to Summer Fridays and time off for sick days. - Professional Growth - We want employees hungry for advancement, which is why we have a networking budget set aside to give you an opportunity to connect with new contacts and grow your personal media network! - We are a close team that works hard and never forgets to have fun! Media Maison is a full-service, amped-up, creative agency that specializes in PR and Marketing. We successfully bridge a gap most companies can only dream of. We effortlessly blend product development, manufacturing, packaging, branding, product management, public relations, marketing and digital media into one channel. 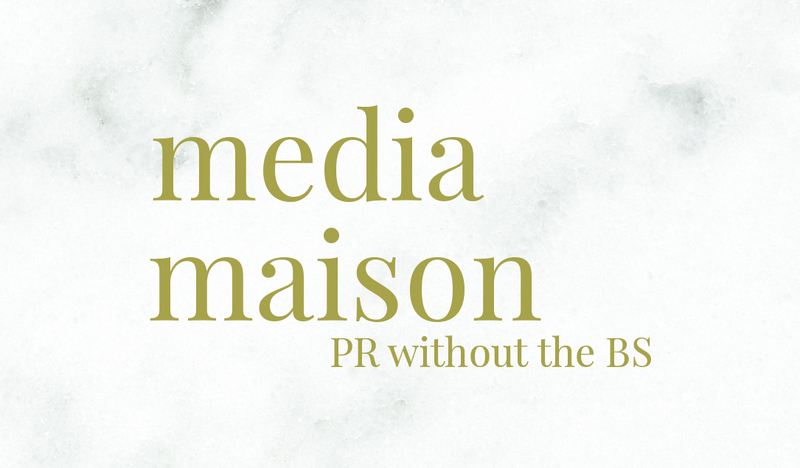 At Media Maison, we work with top-tier national media outlets, top bloggers and online lifestyle/news sites. We have the sustained and seasoned connections that clients crave, making our team unlike any other firm out there.